The Industry MASTER Security Scheme, launched in January last year by the Motorcycle Industry Association and supported by the Police and many of the top brands in the UK, recently announced some impressive theft reduction figures that show clearly how effective the Scheme has already become in the fight against theft. Since its launch over 31,000 new machines have been protected by the Scheme and its' Datatag powered technology. Figures released by the Police show that since this date just 186 registered machines have been reported stolen - an astonishingly low theft rate of just 0.6%. Compared to reported theft figures of non-marked bikes this shows that MASTER protected machines are 4 times less likely to be stolen than those not protected. Welcome news indeed to UK bikers and more encouragingly in the UK, where many of the top manufacturers have come on board to support customers and fight theft, new models will continue to show impressive resistance to theft. The Datatag technologies are fitted before leaving the showroom so customers are never without protection and many dealers are fitting the scheme to showroom display bikes in an attempt to combat store theft too. He went on to say "With so many thefts occurring within the M25 we were surprised to learn through research last year that so many riders are still not using any form of physical security either. We need to encourage a multi-layered approach to combatting theft – 1. physical deterrent through the use of approved locks and chains, 2. Visual/marking deterrent with Datatag to further deter theft and importantly allow positive identification and for those who can afford it 3. a Thatcham approved tracking system. Bikers must take the simple steps to keeping their bike theirs." 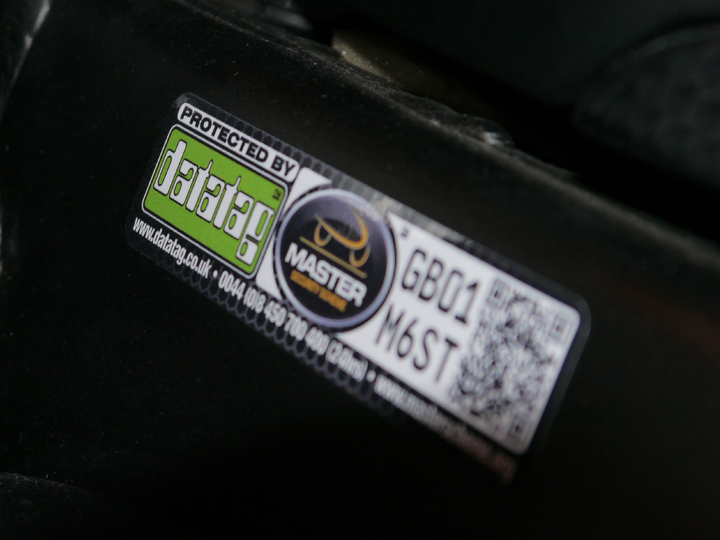 The use of Datatag technology including RFiD transponders and stealth UV etching ensures all parts of the machine are protected and forms an impenetrable barrier to thieves who know that a bike protected by Datatag is far more likely to get them arrested than one not. In fact where Datatag has been used in criminal trials not one has been lost by the Police. Further proof that thieves don't like Datatag. Datatag continue to work with the Industry in a drive to have the Scheme fitted to all new machines. Until then owners of older machines, or those buying a new model from a brand not signed up to the Scheme can still protect themselves by fitting a Datatag Motorcycle Security Kit. 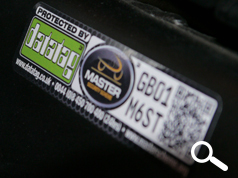 With a retail selling price of just £89.99 and available through their local dealers, Datatag offers protection from theft and peace of mind for owners across the UK.